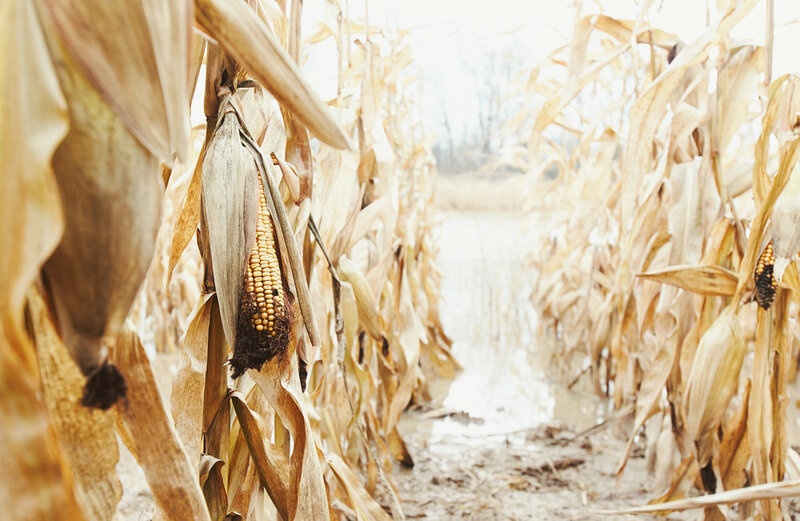 I gazed up at the clear November sky, covered in mud up to my knees, as the sound of cool winds rummaged through the rows of dead corn husks. The air was cold and the light had softened as I sat there after several hours of waiting for a sign of life to cross our paths. I had been anticipating this day for the last couple of months, but hadn’t the slightest clue of how it would all unfold. A connection was made that day, and had stuck with me since. One that I had not expected. Matt, his brother Glenn and their friend Jay had kindly invited me on a hunting trip in Fishersville, Ontario back in the middle of November. They had been tracking geese a few days prior and had set out a plan to execute for the day. This was my first time out on a hunt. I was not to partake in the hunt itself; I was there to witness and capture the essence of it. 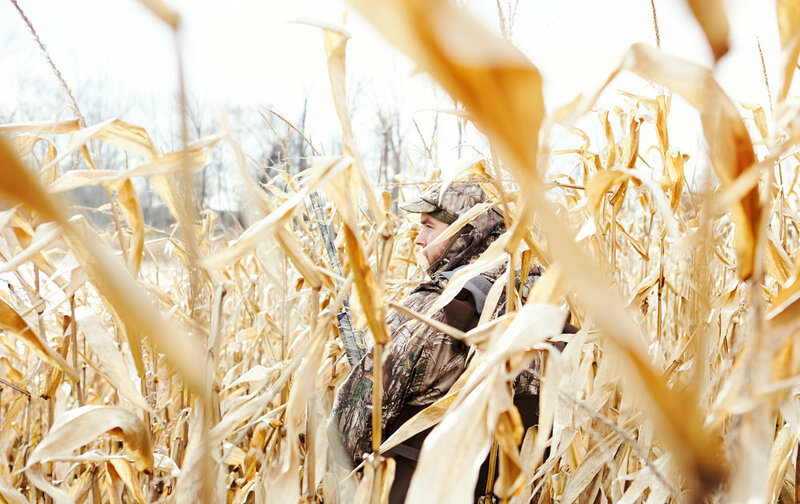 As we made our way across the Ontario back roads in Matt’s pick-up truck earlier that morning, our conversations flip-flopped from hunting to food, and back to hunting. Never having gone on a hunt before, I was naturally full of questions. 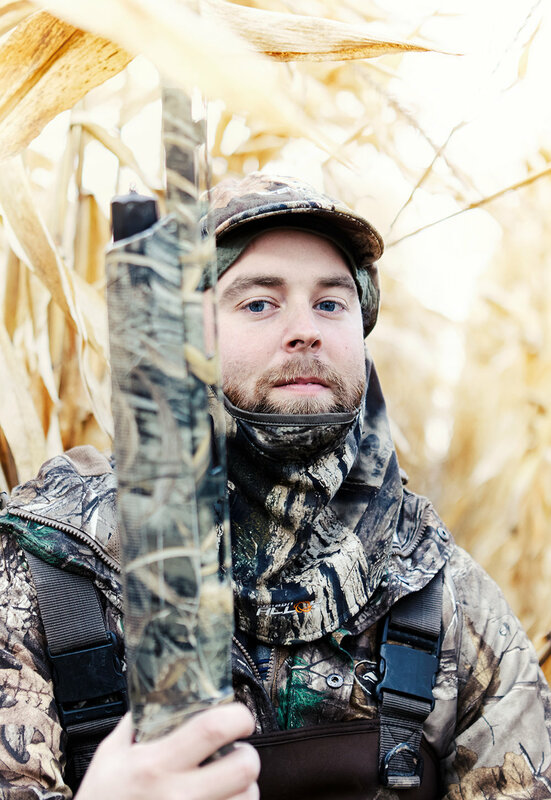 While we covered the basics of legalities, how to’s and things to expect from the day, my main interest was understanding what really drew Matt to hunting. All of these thoughts ran through my mind as the sun started to set over the corn fields. I had been sitting between these rows of husks for over 5 hours without a sight of flying geese, yet I did not feel one bit frustrated. If anything, I felt calm and somewhat in touch with what was around me. I had subtly been consumed by nature’s intricate details. All that was left was for the geese to fly into the flooded field that stood before us. The moment finally came around 17:00. Shots rang out in the distance. Matt popped his head out from the muddy rows of corn we were sitting in to find a grouping of black dots along the horizon starting to make itself more prominent to the naked eye. Matt signaled for us to all lay low as he announced this was going to be ours for the taking. The goose calls rang out from the row next to me, as if an air raid siren was announcing an incoming bombing. As the flock drew closer towards our position, you could sense the tension and anticipation running through everyone’s veins. Matt ceased the calls as the geese flew roughly 500 yards in front of us, scouting the flooded field and the decoys we had set for them. As they flew off into the distance, it seemed that today was not going to be our day. The goose call once again rang out through the corn field, when suddenly, with a swift turn, the geese headed back towards the flooded field. Was this finally going to happen? Waiting on the signal to shoot, I kept peeking up from my camouflaged hood, trying to see what the others were doing; uncertain if my small movements would spook the geese before they were close enough. Before I knew it, over 2 dozen geese flew over our heads, and in a moment of mayhem, guns began firing. I quickly stood up from my chair, trying to capture anything I could, when out of the corner of my eye I saw a goose drop from the sky and hit the water. There it finally was - my first witnessed hunt. Even as a bystander, I’ll admit that seeing that goose go down caught me off guard. A sense of unease and guilt ran through my body, even though I had not pulled the trigger myself. The moment I had been anticipating all day culminated in a lifeless, still body, lying in the flooded field next to me. While I momentarily questioned my ethical stance, my sense of guilt quickly dissipated as my understanding of what this all signified finally came full circle. As we gathered our days bounty I came to fully comprehend what Matt was explaining to me earlier that morning. Hunting does go beyond the strategic planning and the thrill of shooting a gun. And it definitely isn’t like what I’ve read in books or seen in movies. As we had discussed that very morning, there comes a moment where you catch yourself so deeply rooted into the environment that all your senses are heightened beyond recognition. The slightest smells, sounds, or movements are hyper sensitive and your ability to decipher nature's elements becomes crystal clear. Even as a witness to the entire experience, I too could feel that same connection. When you break it all down, the hunt becomes this all encapsulating experience of nature. And beyond that, it puts into perspective our position as meat eaters in today’s society. It educates us on the difficulties of acquiring meat in the wild. It challenges our morals and ethics towards taking another animal's life for the benefit of our own. And to that respect, I believe that it is one of the most humbling food experiences anyone could encounter in their lifetime.